Bright blue is an integral part of ethnic fashion! We mean what a world would be if not for that royal blue kancheevaram silk saree, or an aqua blue designer anarkali! It would be totally blunt. Point in case, a shade of blue is a essential thing in our wardrobe. Let’s begin with a blue blouse. 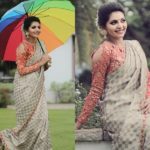 Because, if you want to see the real charm of this color, simply own a pretty blue blouse and you will see how it can be mixed and matched with most of your sarees in the closet. In short, blue is a versatile shade that can blend well with all the attractive co-colors. So investing on a blue blouse is going to save you a lot in terms of styling your sarees. Before we dug deep on what blue blouse design you should own, you need to have an idea on the flattering color tones that all comes under the radar of blue. Yes, when we say blue, we refer to every possible tone that has bluish tint. There is this royal blue, deep navy blue, a peppy aqua blue and other countless bewitching blue under the umbrella of this color palette. Therefore you need to know the kind of blue that would match your skin tone. Because, let’s get real, some shade of blue is not going to flatter you. Hence you must select the shade that elevates your skin tone. When you get this right, you can easily style it with right sarees. Many do the mistake of restricting blue to a blue saree. Of course, there is nothing wrong in it. In fact it is the most obvious thing to do. 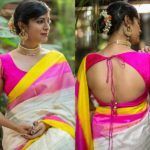 In most of the cases, you might even be getting a default blouse along with your saree that you can’t waste it. 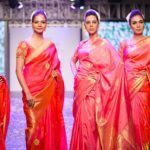 However, if you take time and look for other complimenting sarees to wear with your blue blouse, it would change your saree style dramatically. To seek inspirations, we hunted all leading labels and boutiques on how exactly to match your blue blouse with other unexpected color combinations. The results are undeniably exciting. We spotted cool styling tips from the label ‘Zari’ by Anju Shakar. Now take a look on what sarees to wear with blue blouses! If you have a pretty blue blouse staring at you, check whether you have a mild green saree at your closet. If you have one, it means you can nail an attractive saree look with this combination. The two hues get so well together. How many of you regretted that your grey saree is lacking the spark irrespective of the bright accessory you wear it with? Don’t worry. You can brighten it instantly with a peppy blue blouse. Carrying an orange shade might daunt many for its boldness. To ease off, you can pair with deep shades of blue and achieve that balance. Even your heavy zari filled silk saree can be a spectacle if you wear with a royal blue blouse. Some are not blessed to pull off a yellow saree without looking washed out. Here is the tip. Try it with a blue blouse and see how it works like a magic. Red being a classic color is hard to resist by many. If you open your closet, chances are you might be having more than one saree looking at you pitifully for not wearing it with a majestic blue blouse. It’s just that red and blue are meant to wear together. From the vibrant fuchsia to baby pink, a drop of blue on background will take your saree style to a new level. So, as you see, your blue blouse is not just for its matching blue saree. It can embrace a herd of other colors and totally turn them to a stunner. 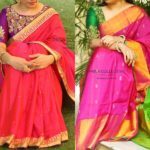 In case, if you like to shop the above sarees and blouses then check the label for inquiries. We know now your mind would be racing to get more unique blouse model for yourself. To help you on that, we searched all the online shopping portal and unearthed 21 cool looking blue blouse designs from Limeroad. Now scroll ahead to check out these designs and pair them with any saree of your choice. To shop them, the link is given at the end of the post. This simple zari blouse with silver detailing can be worn with plain sarees. Imagine wearing this with a orange or red saree? Do you get our point? For a festive saree look, wear this royal blue blouse with a deep red cotton silk saree or with a fuchsia pink designer saree. It can look majestic on both. We love the cute silver thread work here and how it opens the gate to wear this with white and other off-white hue sarees. This deep navy blue blouse is a regal choice to wear with silk sarees of shades red, green and orange. 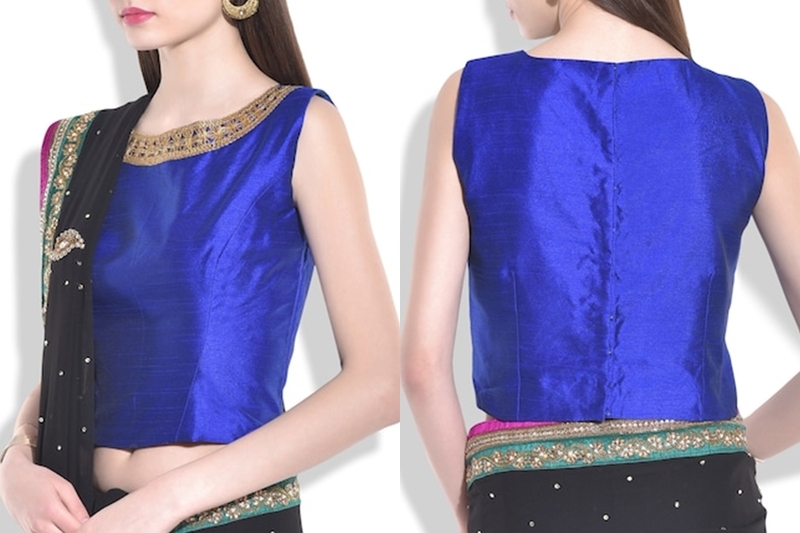 The dull gold zari work give this blue blouse a chic ethnic touch. Needless to mention, that this is a perfect bet for any shade of pink. The back and front open will up the style quotient of your sarees. Wear this muted blue shade with white cotton sarees, and see the compliments pouring in. 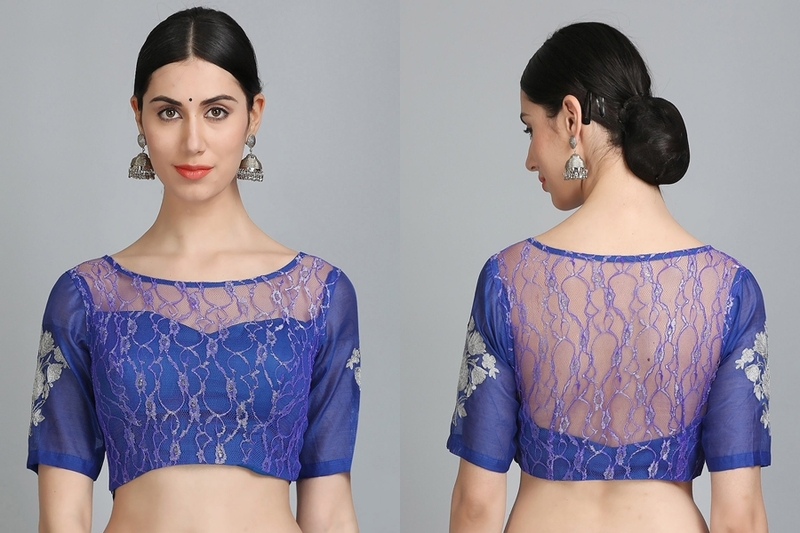 This bright blue designer net blouse can be worn with any pastel color saree. Wear this with fashion jewellery and a glittery pumps to finish off the look. Sky blue and black is another combination to wear together. The floral prints give a fresh look to this admirable color mix here. This pattern blouse with various shade of blue is a versatile one to pair with many sarees on your closet. Dark green, blue, pink are few to mention here. This embroidered silk blouse can not only be a best counterpart for your sarees but also for your lehengas as well. Wear Kerala style kasavu sarees with this number and see how everyone eyes your blouse choice. 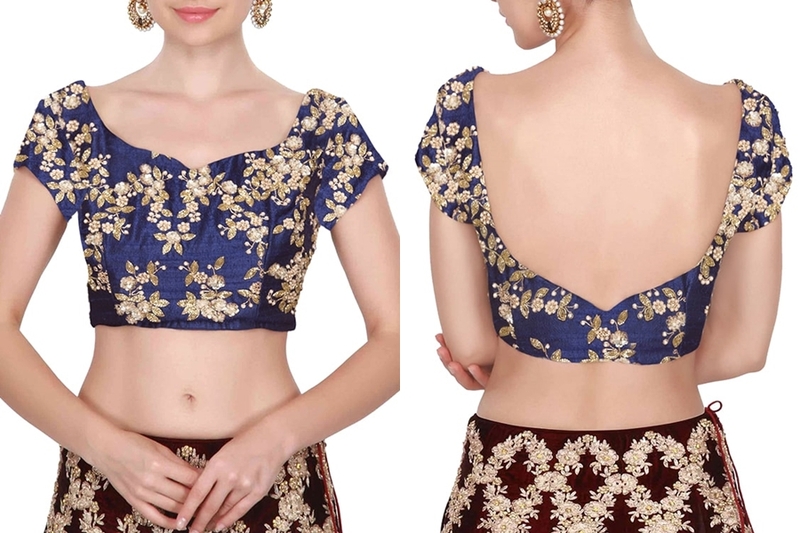 This embellished blue blouse can be matched with all your party wear sarees. You can even wear this simple blouse with formal sarees. Besides it’s roomy bodice would keep you cool on summery days. When high necks are trending everywhere, we urge you to shop this if you want to stay up on the fashion game. This brocade blouse is a blessing for all your expensive silk and banarasi sarees. For a glamm-ed up look, try this bright blue blouse with a peach or orange saree. This is a kind of blue that everyone will fall in love with! Pick this chic cotton blue blouse to match it with handloom sarees of shade grey, white and green. Wear this with your party wear grey saree and finish off your look with silver accessories. You will be lauded for putting unexpected colors together. This is another shade of blue that many fail to experiment with. By now, you might have understood what an incredible color blue is! Don’t kill the potential of a blue blouse by failing to mix it with right saree. Don’t waste time. Pick a blue blouse design of your choice and style it with a complimenting saree. To shop the above blouses, check here. Now tell us your style tips on how to wear a blue blouse and saree together!